Finishing touches are being put to preparations for Lytham Rotary’s second annual Steam Rally at Lytham Hall over the weekend of September 15 and 16. On its debut last year, it attracted more than 1,000 people and raised £11,000, cash which was split between the Hall’s restoration fund and local charities. Rotary officials promised even more attractions this year, including hundreds of steam engines of all sizes, along with classic vehicles. Two of motor racing legend Jackie Stewart’s Formula 1 cars will also be on display. Spokesman Robert Dunn says the event has proved so popular with exhibitors that some applications had to be turned down. As well as a host of family attractions throughout both days, there will be free musical entertainment in a marquee at the Hall on the Saturday evening from 6.30pm to 11pm. Performers will include Gazette columnist Steve Canavan, an accomplished folk singer, and Louise Jacques and the Reminders Band. Robert said: “We were delighted with how the event went on its debut last year and hope we will attract even more people this time. 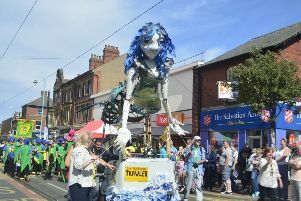 Fylde Council’s tourism and leisure chairman Coun Cheryl Little said: “The Rally is a wonderful event.